PFM PORTS AND ACCESSORIES | ARKRAY, Inc. The implemented ports system for intravenous and intra-arterial application. 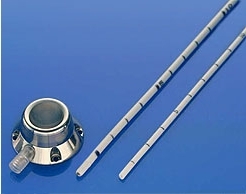 T-Port - standard ports made of titanium are used for intravenous applications in the form of a basic set and a full set which additionally includes the introducer kit (vessel dilator, peel away cannula - coating, guide wire, puncture needle, and tunnelling rod) - used in systemic chemotherapy, long-term parenteral nutrition or long-term medication. 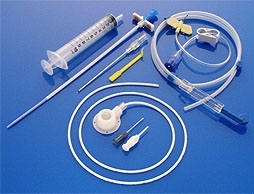 Jet Port Plus - ports made of plastic for intravenous applications, used in systemic chemotherapy, long-term parenteral nutrition or long-term medication and for intra-arterial application, used in regional chemotherapy (basic treatment of liver metastases and the initial phases of liver tumours). Two Versions: basic set and complete set. Tita Jet™ Light - two-component ports made of plastic with the port inlay reinforced with titanium for intravenous applications, used in systemic chemotherapy, long-term parenteral nutrition or long-term medication and for intra-arterial application, used in regional chemotherapy (basic treatment of liver metastases and the initial phases of liver tumours). Two Versions: basic set and complete set. Huber JETCAN™ needles (straight needles, bent needles, bent needles with extension, bent needles with extensions and 3 entries, bent needles with extension and additional access to injection). Made of stainless steel, extensions made of polyvenylchloride (PVC) (outside of the extension) and polyethylene (inside of the extension) ensure optimised tube configuration even when applying of aggressive cytostatics such as Taxol®.